If you thought it was hard to leave the water before, just wait till you’re fishing out of a kayak. They will give you access to spots you couldn’t reach before, BIGGER fish, and one hell of a time! And what the best fishing kayak of 2019 are! The first thing you need to think about when shopping for the best fishing kayaks is if you if you want to buy one preloaded with fishing accessories (rigged) or a plain stock kayak that you soup up yourself. Rigged kayaks can come with several rod holders, spaces designed for tackle boxes or fish coolers. Unrigged ones will have nothing fishing related at all. However, it’s pretty easy to add aftermarket rod holders. You're going to have the choice of a few different materials when shopping. Each of them has their advantages and disadvantages. Rotomolded linear polyethylene: Rotomolded is a single piece of plastic (there is no seam.) These models are incredibly strong, heavy and durable. Three-layer Polyethylene: This is what you’re less expensive boats are made from. Unlike rotomold—which require expensive equipment and molds—they are made from three-layer polyethylene are two molds that have been “thermoformed” together. This process creates a creates a seam where the two molds meat, making it a lot less durable. Kevlar & Fiberglass: both of these materials are reserved for your distance kayaks and sit-on-tops. They are both extremely lightweight but wildly more expensive than your polyethylenes. Sit-on-top is definitely the favorite among anglers. It allows you a lot more freedom and room to work with—which is important when fishing. They also allow you to carry a lot more accessories. True, you can take a very minimalistic approach, but a lot of like to take A LOT of fishing gear. You just never know what the fish are gonna bite! Most of your options are going to be a standard paddle boat; however, you should know it’s not your only option. Some models feature foot pedals that work exactly like bike pedals do. Pedals are pretty popular in fishing kayaks since it frees up your hands to cast. These are the Hobie Outback Kayak pedals in action. Keep reading for the full review below! Do Inflatables Make Good Fishing Yaks? Inflatables have blown up in popularity in large part to their affordability and how easy they are to transport and store. While they are perfect for fishing your local lake, you’ll want to avoid getting an inflatable if you’re primarily going to fishing in the ocean or any white water. They just don’t have the weight to remain stable in high waves, but if you want one with a low barrier of entry, inflatables are worth looking into. The size is going to determine the way it rides greatly. A longer one is always going to be faster than a shorter kayak. When buying a kayak for fishing, though, fast is not really what we’re looking for. That’s why a lot of kayak anglers like a shorter/wider kayak since it offers more maneuverability and a more stable kayak over the fastest kayak. Unless you choose to fish out of a sit-in kayak, a kayak that prioritizes stability will be more versatile when fishing since you’ll be able to stand up and site cast. You need to pay extra attention to the weight of a kayak. If you buy one that’s too heavy for you to lift by yourself, or if your cartop can’t handle specific weights, you’ll be asking for trouble. If you do end up picking out a model that’s a little too heavy for you, look into a kayak trailer and a kayak cart. Please, Double Check Where it Will be Stored! Please, if you do anything before you buy your kayak, measure the room you plan on storing it in! Also, if it’s in a room in your house, make sure you’ll be able to weave the kayak through your hallways to get where it will be stored. 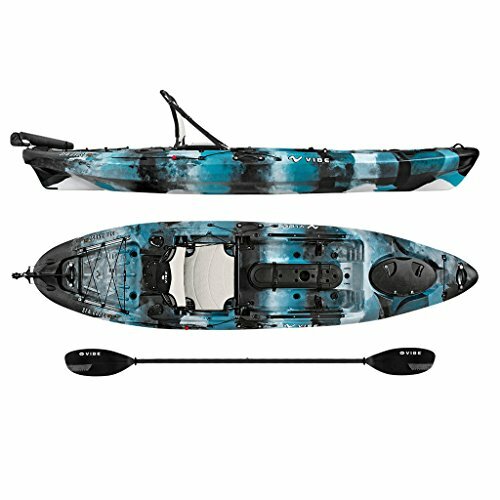 What Fishing Kayak Upgrades Should Fishing Kayak Have? No matter which kayak you pick, rigged or unrigged, long or short, there are certain fishing kayak upgrades any good kayak must have. All rigged fishing kayaks are going to come with places to put your poles built right into the kayak. If you buy an unrigged, then you need to add aftermarket ones. They aren’t just great for freeing up your hands when your bait fishing, but are a great spot to store your rods while you're paddling. Even if you're a minimalist, you’ll want a kayak that A LOT of storage. You need to carry things like an extra paddle, food, cooler, maybe even a sail. Plus, a live vest and a kayak dolly if your kayak is really heavy. Most of the best fishing kayaks will come with more then enough storage for you. I’m sure you know this already, but most fishing trips aren’t just a quick stroll around the lake. No, you’re going to be on the water for hours at a time. Invest in a good high back kayak seat that you can rest up against. No matter how good of a swimmer you are, having a personal flotation device (PFD) on your kayak with you is imperative. Even if you don’t always wear it, just having it within arms reach should your kayak start to take on the water can save your life. They make plenty of unobtrusive models now; that make you forget you’re even wearing one. Pick up a Kayak sail for trolling! One great way to free your hands up for trolling is attaching a sail to your kayak. The wind will do all the work for you, so you can do what you want to, FISH! Your space is already limited when kayak fishing. An excellent way to consolidate your hooks, and have them ready to go as soon as you need them is to keep them, organized on a safety pin. It’s pretty simple, just open the safety pin and slide it through the eye of your hooks. When you’re having fun, it’s always hard to remember safety. You need to always to be prepared for the worst-case scenario, though. Especially since when we’re fishing we’re dealing with sharp hooks and knives. To keep your first aid kit waterproof, vacuum seal it. Use a pool noodle to your angling to the next level! Believe it or not, pool noodles can really come in handy when kayak fishing! Use a wine cork to keep your sunglasses afloat. Polarized glasses are a MUST for any fishing trip. Trust me, the last thing you want to see is your sunglasses sinking to the bottom of the lake. To prevent this from happening, drill a hole through a wine cork and string your sunglass retainer through. Tying a bobber to the handle of your knife is a quick and potentially life-saving fishing hack. You never know what’s going to happen in the wild, and having a knife can get you out of a lot of dicey situations. So you never want to watch your knife go down the drain... literally. Length: 13’ | Width: 33” | Weight: 74 lbs. | Capacity: 550 lbs. The Ghost Angler is by FAR the best sit on stop fishing kayak there is and without a doubt the best for your money. Plus, it's the most stable fishing kayak! It tracks with the best of them and is incredibly fast on the water, but you want to know about the fishing features right? Well, it has a fish finder transducer port, a big tank well, and of course multiple places for your fishing poles. 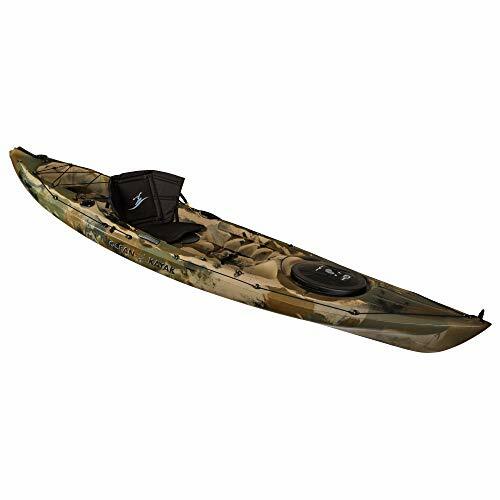 What makes this kayak the best fishing kayak is that it comes installed with a foot controlled rudder system allowing you to carve through the water. The ghost angler is wide and stable making it a great yak to stand and spot cast from, without having to worry about rolling it. It comes with a pre-installed foot controlled rudder system. Which is usually reserved for the more expensive kayaks or a couple hundred dollar upgrade. The side walls of the footwell are extremely thin causing the wall to flex under the pressure of water. Length: 13’4” | Width: 28” | Weight: 56 lbs. | Capacity: 325 lbs. While it might not be the very greatest kayak for fishing, the Ocean Kayak Prowler was definitely designed with fishermen in mind. All the way down to the tiny details like making the scuppers compatible with the transducers for a fish finder. Fast and stable, it even handles wells in high winds. Plenty of great features, as well. Two flush mount fishing pole holders, a HUGE tankwell with bungee, paddle holders, a click Seal bow hatch to name a few. Plus, they included a skid plate allowing you to fishing shallow waters without having to worry about scraping your kayak on rocks. Length: 12’1” | Width: 33” | Weight: 81 lbs. | Capacity: 400 lbs. The is the holy grail of fishing Kayaks, the Hobie Outback. Its rotomolded polyethylene body screams quality the second you see it. It has an adjustable back padded seat with freaking inflatable lumbar support for all day comfort. Comes with a rudder for excellent control in the water. Plus, it has the Hobie Miragedrive which is an awesome pedal system that allows you to absolutely fly through the water. Transducer mounting pocket for your fish finder, pole holders, storage pockets, and cargo area with Bungee tie-downs for all of your fishing gear. You won’t have any issues at all standing up while you’re fishing since its stability is second to none. You just can’t overlook the price. Sure, if you are getting SO much for the cost, but it’s a lot of stuff that isn’t necessary for fishing. Length: 13’2” | Width: 34” | Weight: 86 lbs. | Capacity: 425lbs. 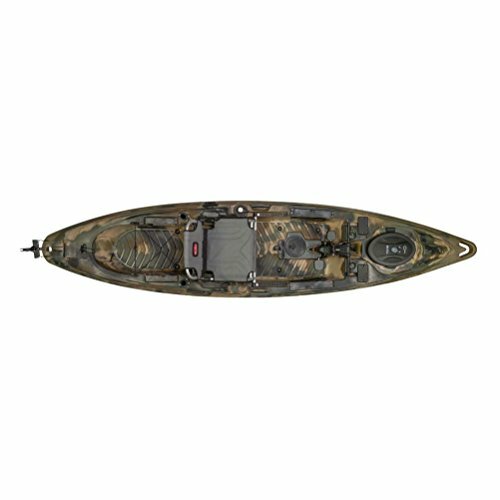 The Predator 13 by Old Town is flat out a top of the line kayak. Very customizable too thanks to its six removable mounts that hook up to fishing pole holders, GPS, fish finders, or slide tracks. The performance tri-hull is designed to tear through water, but that’s not the best part. They even had the standing fishermen in mind when creating this kayak. It comes with a stand-up strap—making it super easy to get to your feet—but also, it has a slip resistant exo-ridge deck helping you to stay on your feet once you’re there. A huge tank well, dual tackle holder, and transducer scuppers—they left no angler features out. Length: 10’9” | Width: 36” | Weight: 41 lbs. | Capacity: 470 lbs. The Sevylor Colorado is by far the best inflatable fishing Kayak around. Some of us don’t have the storage space or the vehicle to transport a hard kayak, so it’s awesome to have a high-quality option like the Colorado! Made from a thick PVC, tarpaulin bottom, and a nylon cover you don’t ever have to worry about it holding up in the water. And should the unthinkable happen and it springs a leak, they designed it with multiple air chambers so should one fail, you can use the other as a PFD to safely get back to shore. Six pole holders, paddle holders, and plenty of d-rings to attach your equipment. 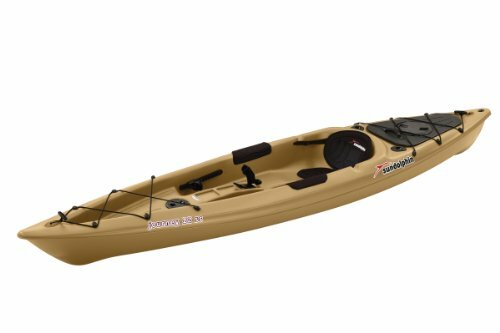 Also, mesh pockets, a built-in pressure gauge, and adjustable seats; this kayak is loaded. That being said, you should know that inflatables are always going to be slower on the water than a hard kayak. Plus, the with where they placed the rod holders it makes it a little difficult to paddle since your paddle will bang it them every stroke unless you go out of your way to dodge them. Length: 9’ | Width: 32” | Weight: 46 lbs. | Capacity: 300 lbs. The Vibe Skipjack has four flush rod holders with caps, a bungee paddle holder, a couple of sealed hatches, tackle storage, AND a tie down area that fits a cooler. That’s just some of what you’re getting with this rotomolded polyethylene kayak. 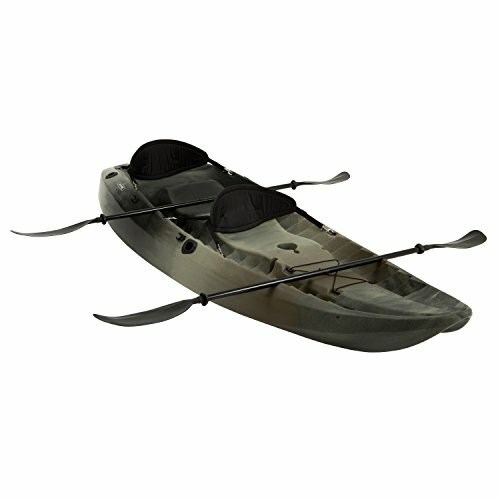 Shorter than a lot of other kayaks—only 9’ long—it’s very lightweight and easy to maneuver. Thanks to it being short and wide, it’s an extremely stable kayak. Length: 10’ | Width: 36” | Weight: 65 lbs. | Capacity: 500 lbs. The Lifetime Sports Tandem﻿ is blow molded from high-density polyethylene and able to carry up to three people. It’s lightweight and easy to maneuver in the water so you can take it out solo if you’re looking for a solid boat with a ton of room. While it is surprisingly great in the water, it doesn’t come with a lot of bells and whistle most fishermen prefer. And it is a pretty basic kayak at this price point. It’s 6’ storage hatch just isn’t a very good idea. Since it runs the length of the boat, anything you put in it will slide to the other end, making it difficult to reach while you're paddling. Length: 10’ | Width: 30” | Weight: 44 lbs. | Capacity: 250 lbs. If you don’t have a lot of money to drop on a boat, then the Sun ﻿Dolphin﻿ Journey could be a good choice for you. Coming with two flush mount rod holders, one swivel pole holder and a live well, it has all the features needed to get you fishing. It’s a sit-on-top made from high-density polyethylene. 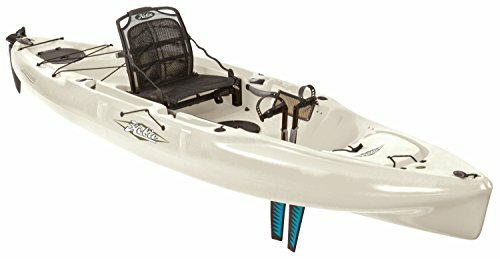 What does our sun dolphin fishing kayak review say? Well, for being so inexpensive, it’s not missing out on features: adjustable foot braces, bungee tie downs, paddle holder, and a wide open cockpit. A huge setback to this model, though, is its stability. Since it’s only 30” wide, it’s not going to be stable enough to stand and fish off of. Length: 10’ | Width: 31” | Weight: 52lbs. | Capacity: 275 lbs. 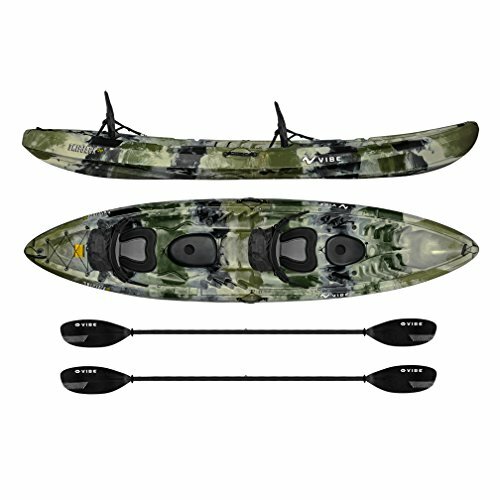 Made from blow-molded high-density polyethylene, the Lifetime Tamarack is a great beginner fishing kayak. Though it doesn’t come with all the bells and whistles that a higher end one does, it has everything you need to get started. A padded (easily replaceable) seat, front and rear shock cords, multiple storage areas and a paddle holder. This boats tracks well and is surprisingly stable. It’s pretty slow when compared to other kayaks its size, and the seat could use upgrading. Seat quality is vital if you plan to be on the water all day! The seat could be better. It is easily replaceable, though. Length: 12” | Width: 29.5” | Weight: 48 lbs. | Capacity: 300 lbs. The Sun Dolphin Journey 12' is a Sit-on-top kayak is made from high-density polyethylene and designed to really carve through the water. Being 12’ long, but only 29.5” wide, this kayak is made to be fast and track well. It has all the features the 10’ model has, but also adds retractable carrying handles and protective thigh pads. Even though it’s only 29.5” wide, it’s surprisingly stable. 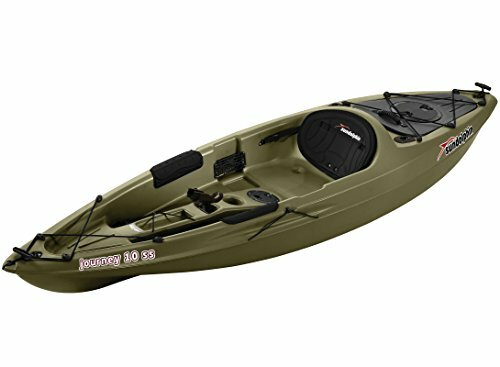 Of course, not enough to deal with big waves or the ocean, but for frequent freshwater fishing trips, this is a great entry level kayak. Length: 9.66’ | Width: 30” | Weight: 40 lbs. | Capacity: 250 lbs. 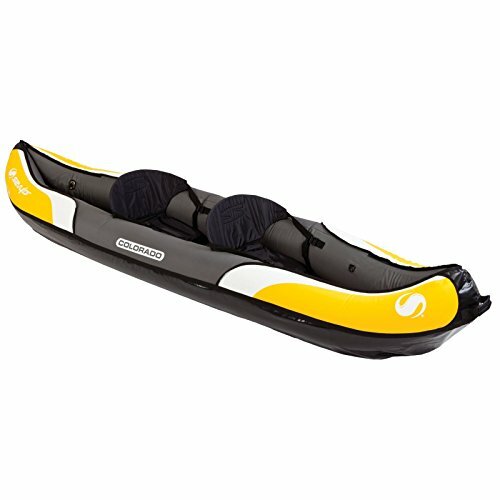 The Sun Dolphin Excursion is a basic entry level kayak that is a great starter kayak. If you’ve been in the sport for years, however, this is not going to be a good fit for you. It has two flush mount rod holders and a swivel fishing pole holder for trolling while you paddle. Also, you're basic storage areas with an adjustable seat and foot pedals. It does track well and is relatively stable in the water. However, when it’s in the water you might experience a little bit of drag—it’s just not a very fast kayak. Length: 10” | Width: 29” | Weight: 49 lbs. | Capacity: 325 lbs. 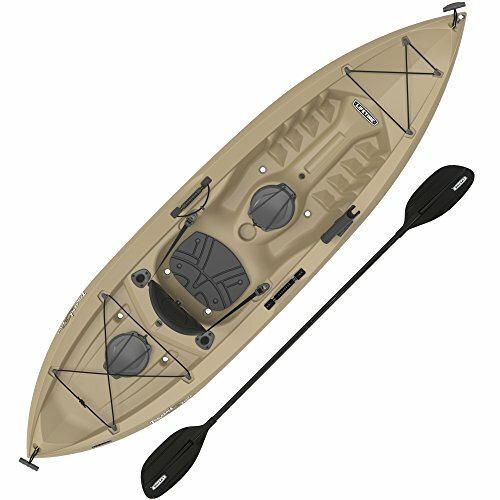 The Vapor by Old Town Canoes is a polyethylene kayak with an anchor trolley system, cup holder for a water bottle, skid plate, and deck bungees. Except for a magic fishing pole, it has just about everything you’d want from one of the best fishing kayaks. Even though it’s only 29” wide, it’s extremely stable. The best part about this kayak is its cockpit. The thing is HUGE, plenty of leg room and room for fishing gear no matter how big you are. This is a sit-in kayak, so depending on your style of fishing—if you want to stand and spot cast—this style might not work for you. Cruising around your local lake in one of the best fishing kayaks makes all the difference between a good trip and a great trip. Stability, storage and price are all huge factors you need to consider when choosing a kayak. What do you think is the best angler kayak? We'd love to hear about it below!